Roadsides, dumps, railroads, vacant lots; first collected in 1912 in Wayne Co. though reported earlier by C. K. Dodge from St. Clair Co. A familiar cultivated ornamental of uncertain origin, perhaps from the Balkans (not from China, as sometimes stated). Doubtless in more disturbed places than the few collections mapped would indicate. 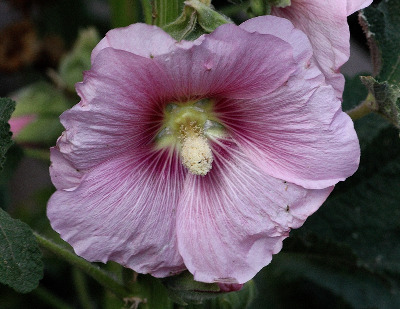 Alcea has often been included in Althaea. The technical distinctions include a 5-angled (rather than terete) staminal column in Alcea, as well as keeled mericarps containing 2 locules (although one of them is empty). The flowers are sometimes “double,” and vary from white to pink or purplish. MICHIGAN FLORA ONLINE. A. A. Reznicek, E. G. Voss, & B. S. Walters. February 2011. University of Michigan. Web. April 24, 2019. https://michiganflora.net/species.aspx?id=1667.